After defending its business model from the onslaught of analysts for the better part of a year, JetBlue has outlined a clear cut plan to shore up revenue and keep its units cost growth at roughly 2% or lower beginning in CY2015. In a nod to persistent prodding by investors to densify its aircraft, JetBlue plans to add 15 seats to to 130 Airbus A320 narrowbodies beginning in CY2016 while deferring some narrowbody deliveries to pare down its capital expenditure commitments. JetBlue is placing itself in a sensitive position – looking for ways to appease shareholders while preserving its image as one of the more customer friendly airlines. It is turning out to be a tough, but seemingly inevitable predicament for the airline. But that is only normal for any business seeking to buck the ternd. In addition to densifying its Airbus A320s, JetBlue has offered more details about its previously announced plans to introduce fare families in CY2015, which unsurprisingly includes a bag fee in the lowest tier. JetBlue president and incoming CEO Robin Hayes admitted the initiatives under way are a significant change; but highlighted the airline’s history is full of change, citing its adoption to a second fleet type (which used to be atypical for a low cost airline) – the Embraer 190 – as an example. The company has been caught in a difficult position during the last few years, stressing its stature as a growth airline; but not generating the same financial returns as other growing airlines. Although JetBlue’s business model is vastly different from Spirit, some industry observers point to Spirit’s stellar financial performance compared to what could be perceived as more modest results from JetBlue. JetBlue operates a fleet of over 200 aircraft compared with roughly 61 at Spirit. Between 2011 and 2013 Spirit’s operating revenues grew by 37%, 23% and 25.5%, respectively. During that time period JetBlue’s operating revenues increased by 19%, 10.6% and 9%. After JetBlue’s net profits fell by 11% in CY2011, it rebounded with 49% and 31% profit growth in CY2011 and CY2013. Spirit’s profits increased 5% in CY2011, 42% in CY2012 and 63% in CY2013. But perhaps as a more important measure, Spirit delivered a 20% ROIC after tax for the 12M ending Sep-2014, while JetBlue missed its goal of improving its ROIC by 1ppt. It also recently declared it would miss its stated 7% target in CY2014. JetBlue’s strategy is to offer a certain level of frills at different price points versus the pure unbundled model adopted by Spirit. 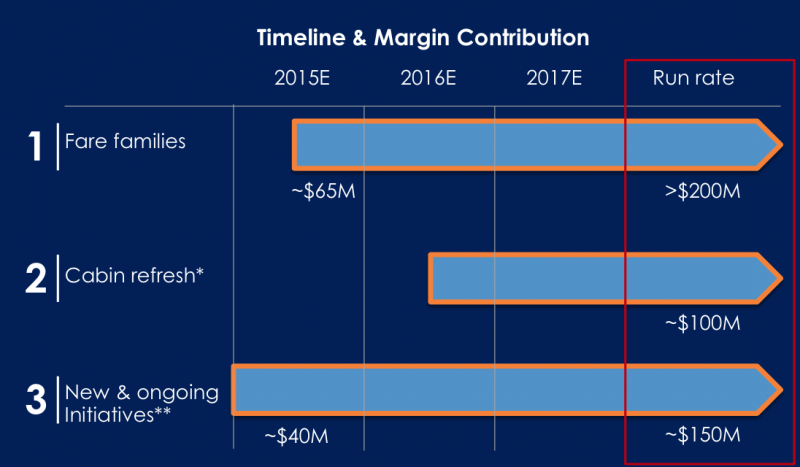 In theory that should drive margin expansion; but JetBlue’s operating margin grew from 10.5% to 10.7% year-on-year in 3Q2014 while Spirit’s operating margin increased from 20.3% 21.3% during the same time period. In an effort to improve its revenues and margins, JetBlue is introducing the fare families, adding seats to its aircraft and leveraging existing products including its newly launch Mint premium offering and its Even More product suite that includes more legroom, and in some instances, expedited security screening. Taking all of those initiatives into account, JetBlue estimates it will generate USD450 million in annual operating income on a run rate basis in CY2017. The planned increase in seats on its 150-seat Airbus A320s drew inevitable backlash from consumers. At its current 34.7in pitch, JetBlue has one of most generous coach legroom offerings in the US industry. After the reconfigurations are complete, its economy pitch will fall to 33in, which by is own calculations will still be the highest in the industry, slightly above the 32.6in pitch in Virgin America’s economy class. One aspect of JetBlue’s logic in adding seats to its A320s is that it allows the airline to drive revenue growth due to its ability to offer more seats a lower fares. The airline expects that the extra seat should generate USD100 million in incremental operating income by CY2019. 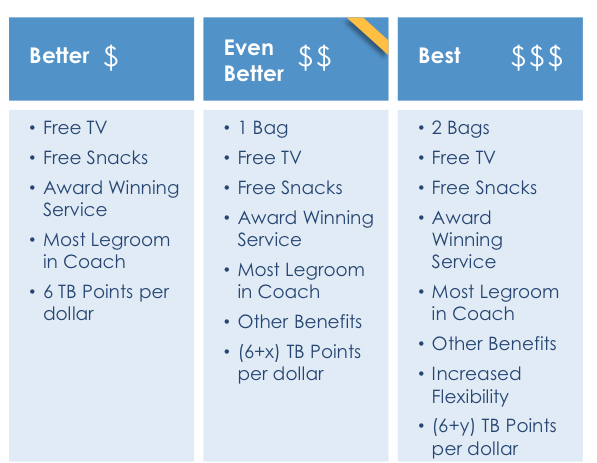 JetBlue estimates its new fare bundles to generate USD200 million annually beginning in CY2017. The airline sees upside from that estimate as the fare bundles mature and it dynamically prices the packages. JetBlue debuted its Mint product in Jun-2014 on service from New York to Los Angeles followed by its flights from New York to San Francisco in Oct-2014. The airline is equipping 11 of its new Airbus A321s with 16 flatbed seats, four of which are closed off private suites. Mint remains in its infancy, but JetBlue recently outlined the revenue deficit it was experiencing in the US transcontinental market without a premium product offering. Prior to introducing Mint, JetBlue estimates that its total revenue per flight from JFK to Los Angeles was running at a 10% deficit to Virgin America. The airline recently stated that in Sep-2014, its revenue between JFK and Los Angeles has grown 24% and cost have risen 16%, leading to a 17 point improvement in margin. Along with Mint, JetBlue’s Even More product offering is also one lever it plans to continue pulling to generate its revenue. JetBlue expects Mint to generate USD190 million in revenue during CY2014, and recently stated that Even More revenue per customer had jumped 200% since its debut in 2008. JetBlue has also introduced dynamic pricing into Even More, in some cases pricing on specific route and seat, and still believes there is more revenue upside to the offerings. JetBlue has opted to defer delivery of 18 Airbus narrowbodies scheduled for delivery from CY2016 to CY2018 to CY2022 to CY2023, which should cut its capital expenditures by USD900 million through CY2017. 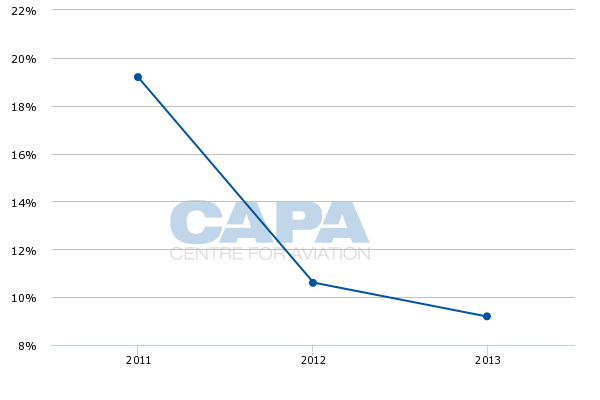 Previously, JetBlue has estimated capital expenditure of USD975 million in CY2014. Coinciding with the aircraft deferrals JetBlue has also offered a return on invested capital target of 10% or greater in CY2017. That may seem lower than the stated ROIC goals by other airlines, but to JetBlue specifically it remains ambitious given its ROIC in CY2013 was 5.3%, and it has already stated it would miss its 7% target in CY2014. The aircraft deferrals should help JetBlue in meeting its stated goals. It also estimates its non-aircraft capital expenditures should fall from USD320 million in CY2014 to USD150 million to USD200 million in CY2015. It has previously stated it would generate negative free cash flow in CY2014, and has not provided guidance in that metric for CY2015. JetBlue is also directly addressing its higher unit cost growth during the last couple of years by stating that its unit cost excluding fuel should level off at 2% or less starting for the time period spanning CY2015 to CY2017. 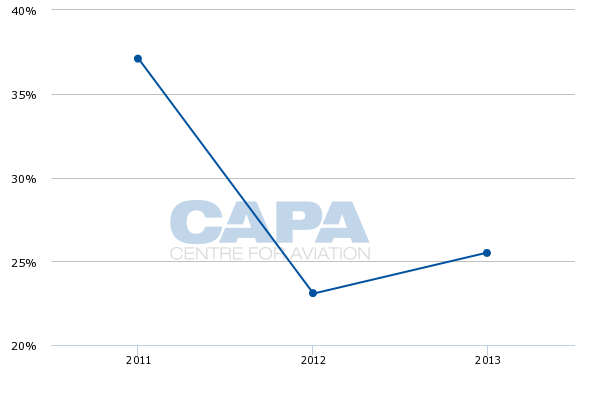 The airline has previously explained that about 60% of the forecast 2.5% to 4.5% rise in unit costs excluding fuel in CY2014 is driven by a new pilot contract that will cost a total of USD145 million between CY2014 and CY2016. JetBlue also faces some maintenance cost headwinds from heavy checks in CY2015, but remarked that it can reach its cost targets through improvements in maintenance planning and inventory and other employee groups working to bring costs down. Keeping customers and analysts happy is a hazardous expedition. The ultimate judgment will be in JetBlue's financial results - essentially dependent on whether the higher cost base of the airline's hybrid strategy can generate yield margins that justify that cost premium. JetBlue’s shareholder-friendly moves generated a lot of negative headlines among the consumer press as it was decried for squeezing more seats on its aircraft (albeit still the largest seat pitch) and charging for a first checked bag (even though most others do). But for most of the last year the backlash has been from the investment community, which has become increasingly vocal about seeing returns on JetBlue’s numerous investments that were designed to both generate revenue premiums while preserving its pledge to restore humanity to air travel. It is a tricky situation for the airline as many of its efforts to appease shareholders will not generate their full benefits for a couple of years, although the near-irresistable baggage charge flows straight through to the bottom line. For JetBlue's new CEO a supreme challenge will be to maintain the friendly airlne's brand image (internally and externally), while gently diluting the differentiated and classy product it has built. JetBlue ultimately had no choice but to create a game plan that receives the stamp of approval from investors. Now it has to navigate carefully the trade-off between investor satisfaction and customer discord.